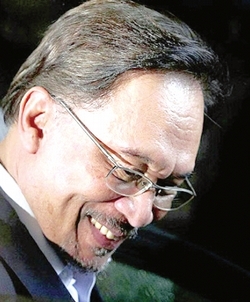 Sec-gen: Seat Anwar will be contesting to be known today | Daily Express Online, Sabah, Malaysia. Kedah: Parti Keadilan Rakyat (PKR) secretary-general Datuk Saifuddin Nasution Ismail said Tuesday that he will be announcing which parliamentary seat PKR president-elect Datuk Seri Anwar Ibrahim (pic) will be contesting today (Wednesday) at PKR's headquarters.He said Anwar would also be present at the press conference to make the announcement. "At 11 am tomorrow I will be issuing a press alert on the announcement," he told reporters after visiting the families of victims of the bridge collapse incident in Taman Serdang, Bandar Baharu near here. However, Saifuddin said the seat was not Pandan which is held by Anwar's wife Datuk Seri Dr Wan Azizah Wan Ismail, who is also Deputy Prime Minister. Two men were killed in the incident last night. In SEREMBAN, Negeri Sembilan Menteri Besar and state PKR chief Aminuddin Harun said he had no knowledge that Anwar would be contesting the Port Dickson seat. "I did not receive any information, so how did you media get the information?," he said when asked by Bernama about it. An English daily today had speculated that Anwar will be contesting that seat which is held by Datuk Danyal Balagopal Abdullah, who is PKR's sole MP in Negeri Sembilan. In KUANTAN, PKR vice president Fuziah Salleh, who is also Deputy Minister in the Prime Minister's Department and MP for Kuantan, when met by reporters at the Pahang-level Maal Hijrah celebration, said that she would be more than willing to give up her seat for Anwar. The issue of which seat Anwar will be contesting has been hogging the headlines the past few days. The prime minister-in-waiting has to win a by-election in order to take over the prime minister's post from Tun Dr Mahathir Mohamad.